$59 gets you a 30 min. session and must be in the Blue Springs, MO area. The package comes with 3 edits of your choice and a CD of just the edited images (with a print release of course). Problems deciding on only 3, you can always add extra edits, or if you are really set on getting all the images, you can always upgrade your CD, both for an additional cost. These Mini Sessions are an every day photo session, and not the same as ones that may be offered around holidays. If you have any questions about them, or would like to book your mini session, just contact me. And as I mentioned above, I had a couple of things that I would be doing. The second one will be an emailer that I will be starting a bit later into 2014 to help everyone know when I have a special or an event coming up. But, as I'm still getting that set up, please stay up to date on my facebook page to hear about all the things I'm working on and planing! Heres to a beautiful and photogenic 2014! 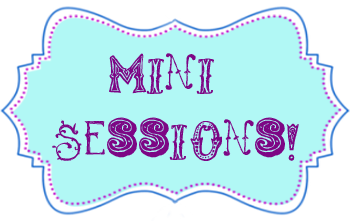 Who's ready for a Mini Session! ?